Brian J. Moore, Ph.D., Carol Stocks, Ph.D., R.N., and Pamela L. Owens, Ph.D. This Healthcare Cost and Utilization Project (HCUP) Statistical Brief presents information on ED visits between 2006 and 2014. Population-based ED visit rates in 2006 and 2014 are provided by patient characteristics, whether the ED visit resulted in admission to the same hospital or resulted in the patient being treated and released, and the type of first-listed diagnosis for the ED visit. The first-listed diagnosis for ED visits was grouped into four categories—injury, medical, mental health/substance abuse, and maternal/neonatal. Trends in ED visits by expected payer from 2006 to 2014 are presented along with changes in the distribution of expected payer by type of first-listed diagnosis of the visit. The number of ED visits for the most frequent first-listed diagnoses seen in the ED and the diagnoses with the greatest percent change between 2006 and 2014 are compared. Relative differences in estimates of 10 percent or greater are noted in the text. Table 1 presents the distribution and rate of ED visits in 2006 and 2014, overall and by select characteristics. There were 137.8 million emergency department (ED) visits in 2014, with a rate of 432 per 1,000 population. The number of ED visits increased 14.8 percent from 2006 to 2014. Comparing the 2 years, the U.S. population grew 6.9 percent. The number of ED visits covered by Medicaid and Medicare increased between 2006 and 2014 (66.4 percent and 28.5 percent, respectively), whereas the number of ED visits covered by private insurance decreased (10.1 percent). The rate of ED visits for medical conditions increased 11.7 percent from 2006 to 2014. Diagnoses involving abdominal pain were the most frequent medical diagnoses for ED visits in 2014 (6.0 million visits). The rate of injury-related ED visits decreased 12.9 percent from 2006 to 2014. Among injury-related ED visits, sprains and strains were the most frequent first-listed diagnoses in 2014 (5.8 million visits). The rate of mental health / substance abuse-related ED visits increased 44.1 percent from 2006 to 2014, with suicidal ideation growing the most (414.6 percent increase in number of visits). Among mental health/substance abuse-related ED visits, alcohol-related disorders were the most frequent diagnoses in 2014 (1.5 million visits). Notes: Percent change is reported based on unrounded values. Population-specific denominators are used to calculate the ED visit rate per 100,000 population (i.e., population rates are specific to the year and subcategory of interest). a N=120.0 million in 2006, and N=137.8 million in 2014. Overall, the number of ED visits in the United States increased 14.8 percent from 2006 to 2014. In 2006, there were 120.0 million ED visits in the United States. By 2014, there were 137.8 million ED visits, an increase of 14.8 percent. During that time period, the U.S. population grew 6.9 percent.10 The percentage of ED visits resulting in admission to the same hospital was similar in 2006 and 2014 (15.4 and 14.1 percent, respectively). Comparing 2006 and 2014, the percentage of ED visits increased among the following patient subgroups: those aged 45-64 years, those with low income, and those residing in large central metropolitan areas. The distribution of ED visits changed for certain patient demographic groups between 2006 and 2014. The percentage of all ED visits for patients aged 45-64 years increased from 20.7 to 23.5 percent. The percentage of all ED visits for patients from low-income areas increased from 30.5 to 34.4 percent. Finally, the percentage of ED visits for patients residing in large central metropolitan areas increased from 23.5 to 27.8 percent. The population rate of ED visits in the United States was 432 visits per 1,000 population in 2014. In 2014, the treat-and-release ED visit rate was 371.2 visits per 1,000 population; the ED visit rate for those admitted to the same hospital was 61.0 visits per 1,000 population in 2014. Altogether, the population rate of ED visits in the United States was 432.2 per 1,000 population in 2014. The rate of ED visits was highest for patients aged 65 years and older, but the rate increased the most between 2006 and 2014 for patients aged 45-64 years. In both 2006 and 2014, patients aged 65 years and older had the highest rate of ED visits (543.7 and 538.3 per 1,000 population, respectively). However, patients aged 45-64 years had the largest increase in rate of ED visits, from 330.4 visits per 1,000 population in 2006 to 387.9 visits per 1,000 population in 2014—an increase of 17.4 percent. The ED visit rate was higher for females than for males in both 2006 and 2014. The ED visit rate for females was 430.3 visits per 1,000 population in 2006 and 472.3 visits per 1,000 population in 2014. The ED visit rate for males was lower than for females in both years: 373.2 visits per 1,000 population in 2006 and 390.7 visits per 1,000 population in 2014. The rate of ED visits for patients living in low-income areas increased from 2006 to 2014 but showed little change for patients living in higher-income areas. Among patients living in low-income ZIP Codes (i.e., the lowest quartile), the ED visit rate increased 23.0 percent—from 493.5 visits per 1,000 population in 2006 to 607.1 visits per 1,000 population in 2014. The ED visit rate for patients living in higher-median-income ZIP Codes was 366.1 visits per 1,000 population in 2014, virtually unchanged from 360.8 visits per 1,000 population in 2006. Comparing 2006 and 2014, the ED visit rate increased in large central metropolitan areas and in medium and small metropolitan areas, whereas the rate decreased in suburban areas. ED visit rates were the lowest in the West region. The ED visit rate increased 23.3 percent for patients living in large central metropolitan areas and 13.1 percent for patients living in medium and small metropolitan areas between 2006 and 2014. The ED visit rate for patients living in large fringe metropolitan areas (i.e., suburbs) decreased 12.2 percent from 2006 to 2014. The ED visit rate in both 2006 and 2014 was highest among patients living in micropolitan and noncore areas (i.e., rural areas) (472.7 and 512.5 visits per 1,000 population, respectively). Although the ED visit rate did not change by 10 percent in any regions between 2006 and 2014, the ED visit rate in the West was lower than in all other regions in both years (West: 316.5 and 342.0 per 1,000 population in 2006 and 2014 versus other regions: 421.6 to 431.9 per 1,000 population in 2006 and 456.1 to 461.4 per 1,000 population in 2014). Figure 1 presents the number of ED visits by expected primary payer from 2006 through 2014. Notes: Percent change is reported based on unrounded visit counts. ED visits with an expected primary payer of other or missing are not shown. Line graph showing number of emergency department visits in millions by payer, 2006-2014. 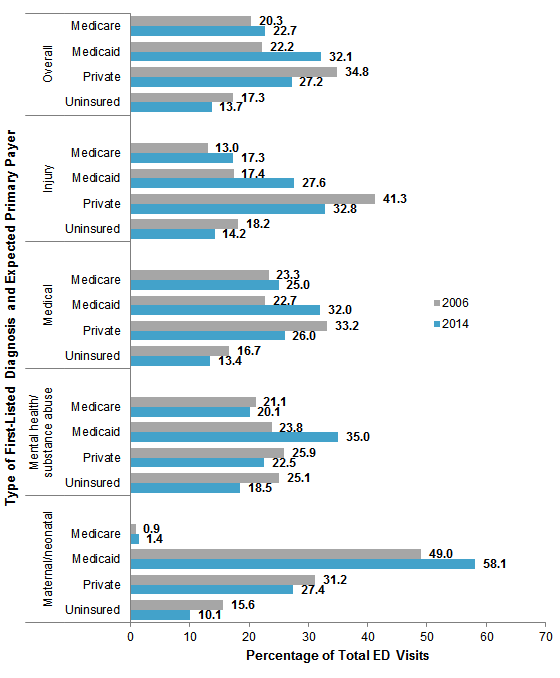 Medicaid: 2006, 26.5; 2007, 26.3; 2008, 27.7; 2009, 31.9; 2010, 32.5; 2011, 35.9; 2012, 37.9; 2013, 38.1; 2014, 44.1—cumulative increase 66.4%. Private insurance: 2006, 41.6; 2007, 42.9; 2008, 43.3; 2009, 42.4; 2010, 40.2; 2011, 38.6; 2012, 37.1; 2013, 36.7; 2014, 37.4—cumulative decrease 10.1%. Medicare: 2006, 24.3; 2007, 24.3; 2008, 25.5; 2009, 25.9; 2010, 26.9; 2011, 28.4; 2012, 29.1; 2013, 30.4; 2014, 31.2—cumulative increase 28.5%. Uninsured: 2006, 20.7; 2007, 22.5; 2008, 21.7; 2009, 22.1; 2010, 22.9; 2011, 21.5; 2012, 23.2; 2013, 23.0; 2014, 18.9—cumulative decrease 8.7%. Between 2006 and 2014, the number of ED visits covered by Medicaid and Medicare increased and the number of ED visits covered by private insurance decreased. The number of ED visits with an expected primary payer of Medicaid increased 66.4 percent between 2006 and 2014, from 26.5 to 44.1 million visits. During this same time, the number of ED visits with an expected primary payer of Medicare increased 28.5 percent, from 24.3 to 31.2 million visits. In contrast, the number of ED visits with an expected primary payer of private insurance decreased 10.1 percent from 41.6 to 37.4 million visits. In 2006, private insurance was the most frequent payer for ED visits in the United States, but by 2014 Medicaid was the most frequent payer for ED visits. In 2006, private insurance was the most frequent expected primary payer of ED visits, with 41.6 million visits—accounting for 35 percent of all ED visits (not shown). By 2014, Medicaid was the leading expected payer for ED visits, with 44.1 million visits—accounting for 32 percent of all ED visits (not shown). Table 2 presents ED visit rates by type of first-listed diagnosis for ED visits overall and separately for ED visits that resulted in an admission to the same hospital and ED visits that were treated and released in 2006 and 2014. Notes: Percent change is reported based on unrounded rates. The overall ED visit rate for injuries decreased from 2006 to 2014, whereas the rate for medical, mental health/substance abuse, and maternal/neonatal visits increased. The overall ED visit rate for injuries decreased 12.9 percent between 2006 and 2014, from 93.9 to 81.8 visits per 1,000 population. The ED visit rate for medical diagnoses increased 11.7 percent from 284.2 to 317.5 visits per 1,000 population, the ED visit rate for mental health/substance abuse diagnoses increased 44.1 percent from 14.1 to 20.3 visits per 1,000 population, and the ED visit rate for maternal/neonatal diagnoses increased 25.3 percent from 10.1 to 12.7 visits per 1,000 population. The rate of ED visits resulting in an inpatient admission increased from 2006 to 2014 for mental health/substance abuse and maternal/neonatal visits. The ED visit rate among mental health/substance abuse visits that resulted in an admission to the same hospital increased 31.8 percent between 2006 and 2014, from 3.4 to 4.5 visits per 1,000 population. The ED visit rate among maternal/neonatal visits that resulted in an admission increased 23.4 percent from 1.4 to 1.7 visits per 1,000 population. The rate of treat-and-release ED visits for injuries decreased from 2006 to 2014, whereas the rate for medical, mental health/substance abuse, and maternal/neonatal treat-and-release ED visits increased. The treat-and-release ED visit rate for injuries decreased 13.1 percent between 2006 and 2014, from 88.6 to 77.0 visits per 1,000 population. The treat-and-release ED visit rate increased for medical (15.2 percent), mental health/substance abuse (48.1 percent), and maternal/neonatal (25.6 percent) diagnoses. Figure 2 presents the distribution of expected primary payer for ED visits by type of first-listed diagnosis (injury, medical, mental health/substance abuse, and maternal/neonatal) comparing 2006 and 2014. Bar chart showing percentage of total emergency department visits by type of first-listed diagnosis and expected primary payer, 2006 and 2014. Overall: Medicare: 2006, 20.3; 2014, 22.7. Medicaid: 2006, 22.2; 2014, 32.1. Private: 2006, 34.8; 2014, 27.2. Uninsured: 2006, 17.3; 2014, 13.7. Injury: Medicare: 2006, 13.0; 2014, 17.3. Medicaid: 2006, 17.4; 2014, 27.6. Private: 2006, 41.3; 2014, 32.8. Uninsured: 2006, 18.2; 2014, 14.2. Medical: Medicare: 2006, 23.3; 2014, 25.0. Medicaid: 2006, 22.7; 2014, 32.0. Private: 2006, 33.2; 2014, 26.0. Uninsured: 2006, 16.7; 2014, 13.4. Mental Health/Substance Abuse: Medicare: 2006, 21.1; 2014, 20.1. Medicaid: 2006, 23.8; 2014, 35.0. Private: 2006, 25.9; 2014, 22.5. Uninsured: 2006, 25.1; 2014, 18.5. Maternal/Neonatal: Medicare: 2006, 0.9; 2014, 1.4. Medicaid: 2006, 49.0; 2014, 58.1. Private: 2006, 31.2; 2014, 27.4. Uninsured: 2006, 15.6; 2014, 10.1. For all types of first-listed diagnoses, the percentage of ED visits billed to Medicaid increased and the percentage of visits billed to private insurance and visits for the uninsured decreased between 2006 and 2014. A disproportionate increase in injury-related ED visits billed to Medicare (13.0 to 17.3 percent of injury-related ED visits in 2006 and 2014, respectively) and Medicaid (17.4 to 27.6 percent of injury-related ED visits). A disproportionate decrease in the mental health/substance abuse-related ED visits for the uninsured (25.1 to 18.5 percent of mental health/substance abuse-related ED visits in 2006 and 2014, respectively). A disproportionate decrease in maternal/neonatal-related ED visits billed to private insurance (31.2 to 27.4 percent of maternal/neonatal-related ED visits in 2006 and 2014, respectively) and for the uninsured (15.6 to 10.1 percent of maternal/neonatal ED visits). There was a smaller increase in maternal/neonatal ED visits billed to Medicaid (49.0 to 58.1 percent of maternal/neonatal ED visits). Table 3 presents changes in the diagnoses most frequently seen in the ED in 2014 by type of first-listed diagnosis, comparing 2006 and 2014. Values represent national estimates of the number of ED visits in each year. Note: Selection of most frequent first-listed diagnoses was based on 2014 estimates. Sprains and strains, superficial injury (contusions), and open wounds of extremities were the most frequent first-listed diagnoses for injury-related ED visits in 2014. The most common injury-related diagnoses for ED visits in 2014 were sprains and strains, superficial injuries (contusions), and open wounds of extremities. All of the five most frequent injury-related diagnoses for ED visits decreased between 2006 and 2014, ranging from a 9.6 percent decrease for sprains and strains to a 21.3 percent decrease for open wounds of extremities. Abdominal pain, nonspecific chest pain, and spondylosis (back problems) were the most frequent first-listed diagnoses for medical-related ED visits in 2014. The most frequent medical diagnoses for ED visits in 2014 were abdominal pain, nonspecific chest pain, and spondylosis (back problems). All of the five most frequent medical diagnoses for ED visits were more frequent in 2014 than in 2006, ranging from a 9.7 percent increase for skin and subcutaneous tissue infections to a 32.0 percent increase for abdominal pain. Alcohol-related disorders, mood disorders, and anxiety disorders were the most frequent first-listed diagnoses for mental health/substance abuse-related ED visits in 2014. The most frequent mental health/substance abuse diagnoses for ED visits in 2014 were alcohol-related disorders, mood disorders, and anxiety disorders. All of the five most frequent mental health/substance abuse diagnoses for ED visits increased between 2006 and 2014, ranging from a 33.5 percent increase for mood disorders to a 76.3 percent increase for alcohol-related disorders. Hemorrhage during pregnancy was the most frequent first-listed diagnosis for maternal/neonatal-related ED visits in 2014. The most frequent first-listed diagnoses in the maternal/neonatal ED visit category all were related to maternal conditions in 2014. Hemorrhage during pregnancy was the most frequent first-listed diagnosis and was the diagnosis on more ED visits than the remaining four diagnoses combined. Four of the five most frequent maternal/neonatal diagnoses for ED visits increased in frequency between 2006 and 2014, ranging from a 15.3 percent increase for hemorrhage during pregnancy to a 94.9 percent increase for hypertension complicating pregnancy. Note: Diagnoses without at least 10,000 ED visits in either 2006 or 2014 were excluded. a Only four injury diagnoses had increasing visit counts in 2014 compared with 2006. From 2006 to 2014, ED visits for intracranial injury (injury-related ED visits), acute post-hemorrhagic anemia (medical-related ED visits), suicidal ideation (mental health/substance abuse-related ED visits), and prolonged pregnancy (maternal/neonatal-related ED visits) increased in frequency more than other conditions. Among injury-related ED visits, those for intracranial injuries increased more than any other injury-related condition (38.8 percent) between 2006 and 2014. Among medically-related ED visits, those for acute post-hemorrhagic anemia increased the most (314.5 percent) between 2006 and 2014, followed by influenza (250.7 percent) and septicemia (161.3 percent). Comparing 2006 to 2014, ED visits associated with suicidal ideation increased more than any other condition (414.6 percent) across all types of diagnoses. Among other mental health/substance abuse-related ED visits, those for personality disorders and disorders diagnosed in childhood increased more than ED visits for other conditions (112.3 percent and 111.0 percent, respectively). Among maternal/neonatal-related ED visits, those for prolonged pregnancy increased the most (172.6 percent), followed by polyhydramnios (172.0 percent) and previous C-section (163.9 percent). Table 5 presents the diagnoses seen in the ED with the greatest percentage decrease in frequency from 2006 to 2014.
a Only two maternal/neonatal diagnoses had decreasing visit counts in 2014 compared with 2006. From 2006 to 2014, ED visits for open wound of extremities (injury-related ED visits), several medically-related conditions including coronary atherosclerosis and coma, and contraceptive and procreative management (maternal/neonatal ED visits) decreased by over 20 percent. There were no decreases in ED visits for mental health/substance abuse diagnosis categories. Among injury-related ED visits, those for open wound of extremities decreased the most (21.3 percent) between 2006 and 2014, followed by poisoning by other medications and drugs (18.5 percent) and open wounds of head, neck, and trunk (18.4 percent). Among medically-related ED visits, those for coronary atherosclerosis and coma decreased the most (both 34.0 percent), followed by meningitis (31.7 percent). There are 15 first-listed diagnoses included in the mental health/substance abuse ED visit category definition. None of them decreased in frequency from 2006 to 2014. ED visits for contraceptive and procreative management decreased the most among maternal/neonatal-related ED visits (78.6 percent). HCUP Statistical Briefs provide basic descriptive statistics on a variety of topics using HCUP administrative health care data. Topics include hospital inpatient, ambulatory surgery, and emergency department use and costs, quality of care, access to care, medical conditions, procedures, and patient populations, among other topics. The reports are intended to generate hypotheses that can be further explored in other research; the reports are not designed to answer in-depth research questions using multivariate methods. The first-listed diagnosis is the condition, symptom, or problem identified in the medical record to be chiefly responsible for the emergency department (ED) services provided. For ED visits that result in an inpatient admission to the same hospital, the first-listed diagnosis is the principal diagnosis, the condition established after study to be chiefly responsible for the patient's admission to the hospital. CCS categorizes ICD-9-CM diagnosis codes into a manageable number of clinically meaningful categories.13 This clinical grouper makes it easier to quickly understand patterns of diagnoses. CCS categories identified as Other typically are not reported; these categories include miscellaneous, otherwise unclassifiable diagnoses that may be difficult to interpret as a group. First-listed diagnoses were classified into four types based on ICD-9-CM and CCS categories in Table 6.14 Each first-listed diagnosis was assigned to a single category, sequentially, in the following order: maternal/neonatal, mental health/substance abuse, injury, and medical. Note: The definition of injury includes five diagnosis codes that are also included under two CCS diagnosis categories used for the definition of the mental health/substance abuse category—diagnosis 980.0: toxic effect of ethyl alcohol (CCS 660: Alcohol-related disorders) and diagnoses 965.00: poisoning by opium, 965.01: poisoning by heroin, 965.02: poisoning by methadone, and 965.09: poisoning by other opiate (CCS 661: Substance-related disorders). Because of the hierarchical ordering used to assign ED visits to type of first-listed diagnosis categories, discharges with one of these five principal ICD-9-CM diagnosis codes were assigned to the mental health/substance abuse category and not the injury category. The Nationwide Emergency Department Sample (NEDS) is based on data from community hospitals, which are defined as short-term, non-Federal, general, and other hospitals, excluding hospital units of other institutions (e.g., prisons). The NEDS includes specialty, pediatric, public, and academic medical hospitals. Excluded are long-term care facilities such as rehabilitation, psychiatric, and alcoholism and chemical dependency hospitals. Hospitals included in the NEDS have hospital-owned EDs and no more than 90 percent of their ED visits resulting in admission. ED visits include information on all visits to hospital-owned EDs regardless of whether the patient was treated-and-released from that ED or admitted to the same hospital from the ED. ED visits resulting in admission to the same hospital included those patients initially seen in the ED who were then admitted to the specific hospital associated with that ED. The unit of analysis is the ED encounter, not a person or patient. This means that a person who is seen in the ED multiple times in 1 year will be counted each time as a separate encounter in the ED. Micropolitan and Noncore: includes nonmetropolitan counties (i.e., counties with no town greater than 50,000 residents). Community-level income is based on the median household income of the patient's ZIP Code of residence. Quartiles are defined so that the total U.S. population is evenly distributed. Cut-offs for the quartiles are determined annually using ZIP Code demographic data obtained from Claritas, a vendor that adds value to data from the U.S. Census Bureau.16 The value ranges for the income quartiles vary by year. Patients in the first quartile are designated as having low income, and patients in the upper three quartiles are designated as having not low income. The income quartile is missing for patients who are homeless or foreign. For this Statistical Brief, when more than one payer is listed for an ED visit, the fist-listed payer is used. The majority of comparisons are based on 2 years of data, 2006 and 2014. Trends in the number of ED visits by expected primary payer from 2006 through 2014 are presented with the estimates provided for the intervening years. Percentage change equals open parenthesis, open parenthesis, end value divided by beginning value, close parenthesis, minus 1, close parenthesis, multiplied by 100. The HCUP Nationwide Emergency Department Database (NEDS) is a unique and powerful database that yields national estimates of emergency department (ED) visits. The NEDS was constructed using records from both the HCUP State Emergency Department Databases (SEDD) and the State Inpatient Databases (SID). The SEDD capture information on ED visits that do not result in an admission (i.e., patients who were treated in the ED and then released from the ED, or patients who were transferred to another hospital); the SID contain information on patients initially seen in the ED and then admitted to the same hospital. The NEDS was created to enable analyses of ED utilization patterns and support public health professionals, administrators, policymakers, and clinicians in their decisionmaking regarding this critical source of care. The NEDS is produced annually beginning in 2006. Over time, the sampling frame for the NEDS has changed; thus, the number of States contributing to the NEDS varies from year to year. The NEDS is intended for national estimates only; no State-level estimates can be produced. For other information on emergency department visits, refer to the HCUP Statistical Briefs located at www.hcup-us.ahrq.gov/reports/statbriefs/sb_ed.jsp. For more information about HCUP, visit www.hcup-us.ahrq.gov/. Agency for Healthcare Research and Quality. Overview of the Nationwide Emergency Department Sample (NEDS). Healthcare Cost and Utilization Project (HCUP). Rockville, MD: Agency for Healthcare Research and Quality. Updated December 2016. www.hcup-us.ahrq.gov/nedsoverview.jsp. Accessed January 5, 2017. Moore BJ (IBM Watson Health), Stocks C (AHRQ), Owens PL (AHRQ). 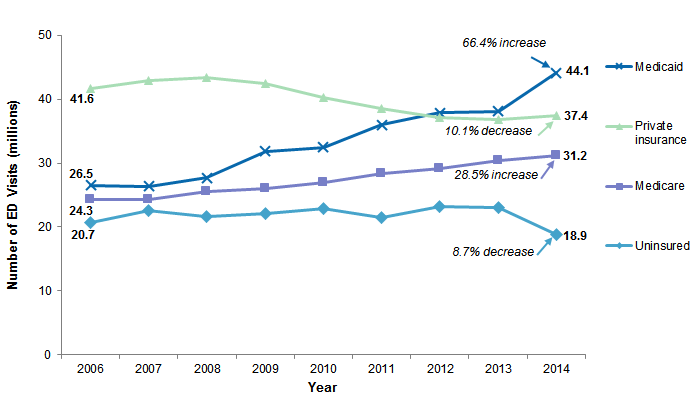 Trends in Emergency Department Visits, 2006-2014. HCUP Statistical Brief #227. September 2017. Agency for Healthcare Research and Quality, Rockville, MD. www.hcup-us.ahrq.gov/reports/statbriefs/sb227-Emergency-Department-Visit-Trends.pdf. The authors would like to acknowledge the contributions of Minya Sheng of IBM Watson Health. This Statistical Brief was posted online on September 12, 2017. 1 Calculated from HCUPnet. Healthcare Cost and Utilization Project (HCUP). 2014. Rockville, MD: Agency for Healthcare Research and Quality. www.hcupnet.ahrq.gov/ Accessed March 24, 2017. 2 Includes ED visits in which patients were not admitted to the hospital associated with the ED. Patients may have been discharged home, transferred to another acute care facility, left against medical advice, went to another long-term or immediate care facility (nursing home or psychiatric treatment facility), discharged to home health, or died. 3 Weiss AJ, Wier LM, Stocks C, Blanchard J. Overview of Emergency Department Visits in the United States, 2011. HCUP Statistical Brief #174. June 2014. Agency for Healthcare Research and Quality, Rockville, MD. www.hcup-us.ahrq.gov/reports/statbriefs/sb174-Emergency-Department-Visits-Overview.pdf. 4 National Academies of Sciences, Engineering, and Medicine. 2007. Hospital-Based Emergency Care: At a Breaking Point. Washington, DC: The National Academies Press. 5 Skinner HG, Blanchard J, Elixhauser A. Trends in Emergency Department Visits, 2006-2011. HCUP Statistical Brief #179. September 2014. Agency for Healthcare Research and Quality, Rockville, MD. www.hcup-us.ahrq.gov/reports/statbriefs/sb179-Emergency-Department-Trends.pdf. 6 National Academies of Sciences, Engineering, and Medicine, 2007. Op. cit. 8 Miller S. The effect of insurance on emergency room visits: an analysis of the 2006 Massachusetts health reform. Journal of Public Economics. December 2012;96(11-12):893-908. 9 Ginde AA, Lowe RA, Wiler JL. Health insurance status change and emergency department use among US adults. Archives of Internal Medicine. 2012;172(8):642-647. 10 Barrett M, McCarty J, Coffey R, Levit K. Population Denominator Data for Use With the HCUP Databases (Updated with 2015 Population Data). HCUP Methods Series Report #2016-04. September 29, 2016. Rockville, MD: Agency for Healthcare Research and Quality. www.hcup-us.ahrq.gov/reports/methods/2016-04.pdf. Accessed January 31, 2017. 11 Barrett M, McCarty J, Coffey R, Levit K. Population Denominator Data for Use with the HCUP Databases (Updated with 2015 Population Data). HCUP Methods Series Report #2016-04. September 29, 2016. Rockville, MD: Agency for Healthcare Research and Quality. www.hcup-us.ahrq.gov/reports/methods/2016-04.pdf. Accessed January 31, 2017. 12 Claritas. Claritas Demographic Profile. www.claritas.com. Accessed February 14, 2017. 13 Agency for Healthcare Research and Quality. HCUP Clinical Classifications Software (CCS) for ICD-9-CM. Healthcare Cost and Utilization Project (HCUP). Rockville, MD: Agency for Healthcare Research and Quality. Updated October 2016. www.hcup-us.ahrq.gov/toolssoftware/ccs/ccs.jsp. Accessed February 14, 2017. 14 ED visit types were adapted from the hospital service line variable used in the HCUP State Inpatient Databases (SID). Diagnosis-related groups (DRGs), which are used to distinguish surgical and medical stays with inpatient data, are not available with ED visit data; all ED visits that did not fall into one of the other ED visit types (maternal/neonatal, mental health/substance abuse, or injury) were categorized as medical. Agency for Healthcare Research and Quality. Central Distributor SID: Description of Data Elements-SERVICELINE. Healthcare Cost and Utilization Project (HCUP). Rockville, MD: Agency for Healthcare Research and Quality. Updated August 2008. www.hcup-us.ahrq.gov/db/vars/siddistnote.jsp?var=serviceline. Accessed February 14, 2017. 15 Statistics were obtained from an HCUPnet (www.hcupnet.ahrq.gov) query of discharge status in the 2014 Nationwide Emergency Department Sample (NEDS) among all discharges. Accessed August 31, 2017. 16 Claritas. Claritas Demographic Profile. www.claritas.com. Accessed February 14, 2017. Internet Citation: Statistical Brief #227. Healthcare Cost and Utilization Project (HCUP). September 2017. Agency for Healthcare Research and Quality, Rockville, MD. www.hcup-us.ahrq.gov/reports/statbriefs/sb227-Emergency-Department-Visit-Trends.jsp.